The north-west of Scotland holds a charm like nowhere else in the country. Pitted with glimmering lochans, the land creates mountains that are remote and isolated, hidding secrets well out of view. We're based in Ullapool, the charming village central in the area from where we're striking out to Inverlael for a Munro-bagging spree, hiking up many peaks including Seana Bhraigh, Beinn Dearg and Am Faochagach. 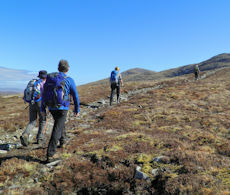 A guided hill-walking and hiking 3 day event in on the mountains of Inverlael and Freevater in the Northern Highlands with one of our experienced and qualified leaders. Your guide will know the mountains well and be able to give you insight into the flora, fauna and geology. Beinn Dearg is vast mountain dominating the land of Inverlael Forest. Surrounding its hulk are several other peaks, including the 3 Munros of Eididh nan Clach Geala, Meall nan Ceapraichean and Cona Mheall. We'll be aiming to hike to the top of these peaks, heading in from the southern end of Loch Broom. 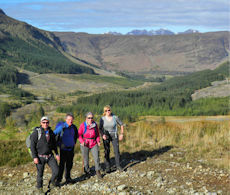 We'll meet at the car-park by the head of Loch Broom and enjoy a gentle walk in on fine tracks and path. A gradual rise leads us to a col between Eididh nan Clach Geala and Meall nan Ceapraichean, where we'll bag both Munro summits then continue south-east over complex terrain with several lochans. An hour's detour will see us visit Cona Mheall's summit with its panoramic views, before we return for a last ascent up vast Beinn Dearg with its interesting 'Destitution Wall'. Fine paths lead us back to the tracks we came in on. 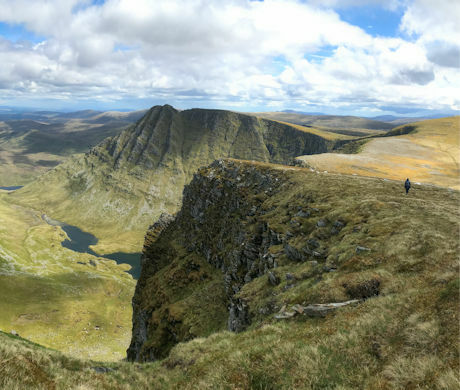 Seana Bhraigh is glacially carved with a beautiful northern corrie with some scrambling required to reach its eastern top Creag an Duine. We start from Inverlael, a few miles south of Ullapool and head into Inverlael forest on a fine track. One ever fainted paths and trods, we'll sneak towards Seana Bhraigh over grassy terrain. Navigation can be really tricky in this vast and remote area, but you'll have an expert navigator leading you ! 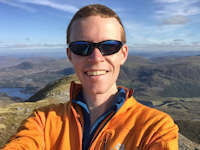 We'll reach Seana Bhraigh's summit and weather permitting we should have our efforts rewarded with vast and distant views from Foinaven in the north, to the Outer Hebrides to the west and An Teallach and Fisherfield to the south. There is the option of some fine, but fairly easy rock-scrambling to leads us onto the small airy summit of Creag an Duine. We return the way we came in. We're heading out on our final Inverlael day to bag one more Munro ! Am Faochagach is a mountain sitting on its own near Loch Glascarnoch. This Munro is a flat-topped hill with heather-clad lower slopes and complex topography in the many shoulders that extend from its centre. We start from the western end of Loch Glasgarnoch, hiking on faint paths that travel though grass and heather. After a bit of fun crossing (possibly wading) the Abhainn Garbhrain, it's uphill and onto the vast plateau on Am Faochagach's southern shoulder. A relaxed walk leads us to the small cairn on the summit. The return is by the same route. The first day begins on a fine track, then on path and eventually grassy undulating terrain. The second day again begins on the same fine track, then on a different path leading to varied terrain, including some boulderfields higher up. The paths on final day are very faint, but the terrain is easy under-foot. Due to the distances covered of the first two days we've classed them as 'demanding'. The final day is shorter with less ascent, therefore classed as 'moderate'. Leading the event on 3-5 August'19. Ullapool makes a great base for these hiking days, being ideally located and having pubs, restaurants and shops. There is a good bus service from Inverness to Ullapool (see this page for more info).